Welcome to the Southern Moreton Bay Islands. Macleay Island is the second largest of the four Bay Islands, situated 30km from Brisbane in the Moreton Bay Marine Park at the southern end of Moreton Bay. It is 6.5km long and 4km wide at its widest point. Protected by North Stradbroke Island to the east, Macleay is connected to the mainland by ferries and barges, which also connect to inter-island transport for the four Bay Islands. 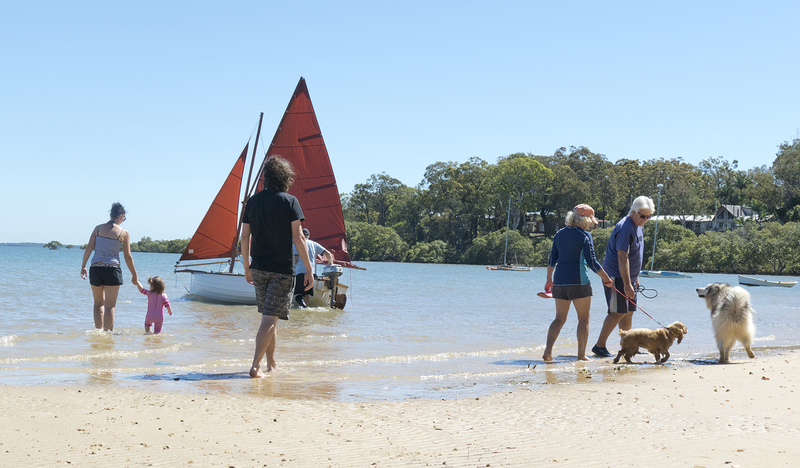 More than 3500 people are resident on Macleay, enjoying several beaches for swimming and fishing, as well as a bowls club, golf course and boat club. There is also an Arts Complex consisting of a studio, gallery and pottery shed. 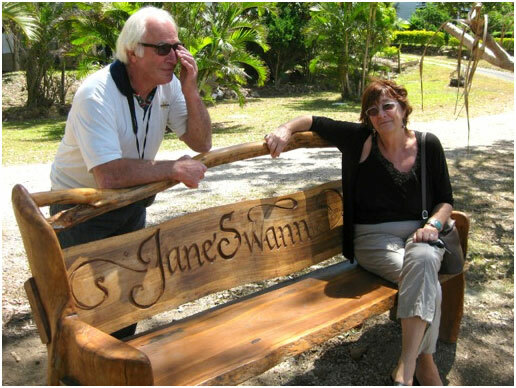 Sculptor Ted Upton and Calligrapher Ruth Venner with a commemorative seat for local resident Jane Swann. Macleay Island has a diverse and interesting history, both aboriginal and european. There seems to be some dispute as to the original aboriginal name, with claims for “Alcheringa” and “Jencoomercha”. Most maps use the former, whereas most council and government information refer to it as Jencoomercha. It was regarded as an aboriginal meeting place of spiritual importance, mainly for the women of the tribes. Later it was named Tim Shea’s Island after a convict who lived alone on the island for fourteen years. 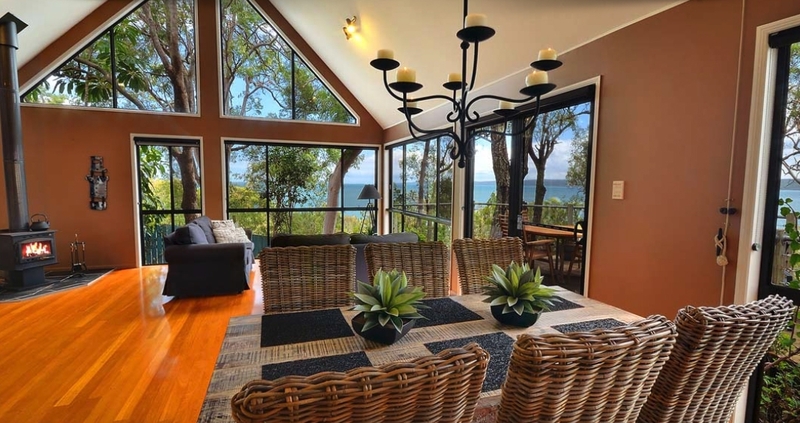 Macleay offers wonderful B&Bs, rental accommodation in delightful cottages, AirB&B with views to sigh over and if you lose your heart to the island, a Real Estate Agent will leave you gasping at the amazing bargains to be had for houses with bay views, bush retreats and more. The Industrial Ruins located at the southern end of Macleay Island appear to be associated with the 1869 establishment of a sugar mill, possibly in conjunction with a salt works. Although no early description of the mill and salt works has been found, documentary evidence reveals that a sugar mill was erected on the island in 1869. Pat’s Park at Potts Point is a popular spot, with bbqs, swings, toilets and a swimming enclosure. Dalpura Beach, located on the western side of the island, is the perfect place to relax on the beach, have a family bbq or go swimming. There is also a boat ramp for recreational boats. This is the best place to check out our beautiful sunsets! Other recreational boat ramps are located at at the end of Mel Street and at Corroborree Park, a pebble beach with deep water. Bay Island Ferries and barges run seven days a week and connect Macleay to the other Bay Islands and to the mainland at Weinam Street in Redland Bay. Residents receive discounted barge fares. See Barge Timetable for updated schedules and rates. See Bay Island Ferry for updated schedules and rates. Macleay is also host to a number of service organisations such as Lions and the Macleay Island Progress Association. A primary school, ambulance station, SES and Volunteer Fire Brigade are based on the island. Check our Community Services page for more information.iThere are several shopping centres and many small island businesses which cater for the community. A business directory on the site gives phone numbers and addresses. For visitors looking for a place to eat, check here.